The Khyber Pakhtunkhwa government has launched KP’s first-ever digital policy. While it is obvious that it aims at the digital transformation of the northern province, there is a lot more to the policy than what meets the eye. This policy aims to remove the piles of files that get in the way of good governance. Moreover, it envisions digital accessibility to reach every corner of the province, promotion of tech startups, and support of entrepreneurs. It also envisages job creation, empowerment, connectivity, and inclusiveness by tapping the Information and Communication Technologies (ICT). Imposition of a tax cut of 19.5 percent on mobile and the fixed broadband services in KP to expand the digital footprint and upgrade the technology infrastructure. Installation of the internet involves the cost of fiber deployment. In order to save on the cost, the policy maintains a provision for broadband conduit deployment. Induction of a phase-wise transformation of broadband services from copper-based networks to optical fiber-based networks across the province to ensure high speed at an affordable cost. Facilitation of the startups, small and medium enterprises (SMEs), and entrepreneurs by providing purpose-built facilities. Promotion of the use of technology in various sectors like education, health, and agriculture to link the far-flung areas with the developed ones. Promotion of investment through Public-Private Partnership (PPP) model in the Digital Access projects. Incorporate digital technologies into government services to improve their performance, reduce costs, and ensure transparency. Mechanism to provide financial investments for SMEs and digital startups. Optimal incorporation of technology use in primary, secondary, and tertiary education. The government also plans to ensure the inclusion of women, youth, and marginalized groups in the digital arena. Moreover, it aims to equip and empower women with digital skills and education along with ensuring their financial inclusion and equitable dividends for the underprivileged currents of the society. The government aims to establish an innovation fund through public-private partnership (PPP) to support the startups and entrepreneurs in the digital space. 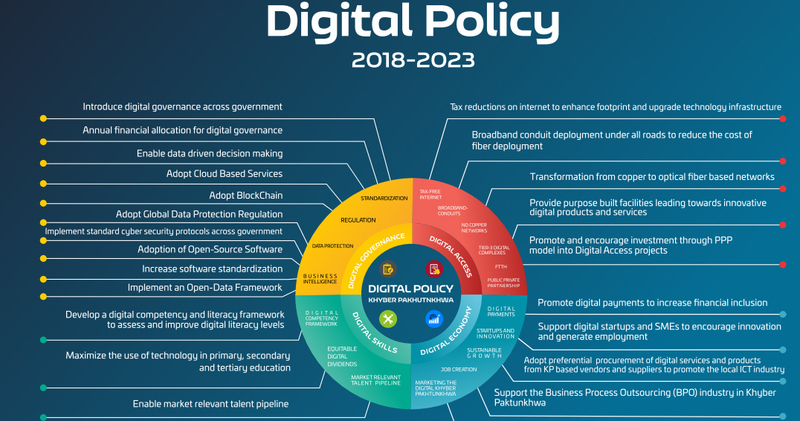 The complete version of the digital policy can be reached here.